The first female nominee delivered an appeal for hope and unity, while the grieving father of a Muslim soldier killed in Iraq lowered the boom on Trump. The Democratic convention began in Philadelphia Monday with party leaders trying to bind wounds and heal divisions among Democrats, as angry Bernie Sanders delegates came to terms with the dimming of their dream. Hillary Clinton closed out the week with a speech that bet against fear and division, an optimistic, self-deprecating pitch driven by the conviction that Americans—Sanders voters as well as Republicans and independents wary of Donald Trump—need to rely on one another to solve the nation’s problems. “I don’t believe anyone who says, ‘I alone can fix it,’” Clinton told a cheering crowd, referring to one of Trump’s strongman lines at last week’s GOP convention in Cleveland. The first female Democratic nominee warmly praised Sanders and his voters. “I’ve heard you: Your cause is our cause,” she told them, promising to work to make “the platform that we wrote together” political reality. “Together” was the word of the week, but it seemed like a wispy hope when the convention began with drama on Monday. Sanders supporters booed when speakers talked up Clinton, until comedian Sarah Silverman, a Sanders supporter, saved the day by saying, “Bernie-or-Bust people, you’re being ridiculous,” and Michelle Obama’s moving endorsement blew away any lingering clouds. A full roll-call vote on Tuesday, which some worried might only spotlight party division, turned into a show of unity, as Clinton and Sanders supporters teamed up to deliver their state’s delegate totals. Even a walkout by 200 or so Sanders diehards–out of 1,900 delegates–didn’t unravel the determined coalition that the Clinton and Sanders teams worked hard to fuse. Clinton has often been criticized for failing to paint a vivid, Elizabeth Warren–style picture of why the economy isn’t working for everyone–that it isn’t just an unfortunate turn of events, but the result of political decisions that favor the rich. On Thursday night, she came closer, telling struggling Americans, “I believe that our economy isn’t working the way it should because our democracy isn’t working the way it should.” She went on to call for overturning Citizens United, fixing Wall Street, and making the wealthy pay their fair share again. But the heart of the speech was an argument for unity and inclusion, and the emotional climax of the night was a searing attack on Trump by the father of a Muslim US Army captain who died in Iraq trying to stop a truck bomb, saving other members of his unit. “Hillary Clinton was right when she called my son the best of America,” a grieving but fierce Khizr Khan told a riveted crowd, talking about his son, Humayun. “Donald Trump, you’re asking Americans to trust you with their future. Let me ask you, have you even read the United States Constitution? I will gladly lend you my copy. In this document, look for the words, look for the words, liberty and equal protection [under] law. Some analysts have raised the question whether the Democrats’ week of unity and optimism is in tune with the anxious tenor of the times. Will voters concerned about a lagging economic recovery, or ISIS, or violence against police, or rising urban homicide rates be soothed by appeals to hope and unity? Trump hopes not. Clinton is counting on it. “He wants us to fear the future, and fear each other,” she told Democrats and a global television audience. 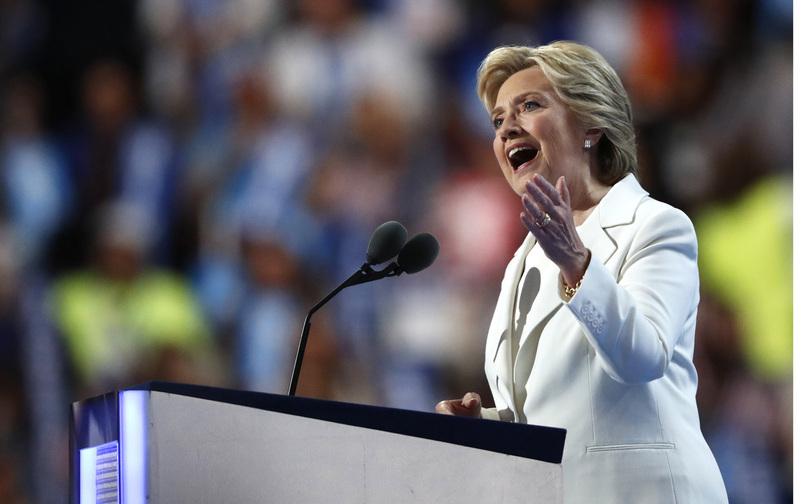 Instant CNN ratings showed 71 percent of viewers liked Clinton’s speech, as opposed to 57 for Trump last week. But what about another crucial audience, Sanders voters? There was a sprinkling of boos from diehards in fluorescent green T-shirts Thursday night, but they were covered over by the cheers of Clinton backers. And while I met a few of the legendary “Bernie Bros” in Philadelphia, I mostly met Sanders delegates who were determined to work inside or with the Democratic Party—a young woman from Indiana who’s running for her local school board, for instance. A young man from Florida wearing a “Still Sanders” button told me that “Still Sanders” means he’ll do what Sanders asks of him—vote for Clinton. His friend from California pitched me on Jill Stein, since I live in New York, but even he was a pragmatist. “I have the luxury of voting Green because I’m not in a swing state.” If, like his friend, he lived in Florida, would he vote for Clinton?